We’ve all watched a TV show, film, or anime where somebody dies and then, as if by magic, it begins to rain. It’s a tried and true cliché that can be utilized to brilliant effect, or come off as incredibly corny depending on the context. Join me as I explore three examples of rain scenes in anime. One superb, one interesting, and one just plain bad. The shows I’ll be using for my examples are: Akame ga Kill, Love, Election and Chocolate, and finally, Fullmetal Alchemist: Brotherhood. The purpose of this (series?) is to explore narrative tools that storyteller’s utilize to (hopefully) enhance the stories they are trying to tell. I chose rain as a starting point because it is rather inoffensive and something that nearly everyone is going to have some experience with. Not only that, but it is such a tired cliché that it is easy to write off any instance of a, “rain scene” as lazy, boring, or uninteresting because of this fact. However, like any tool, it all depends on how it is used. This should be obvious, but there will be light spoilers for each show I discuss. What Exactly is a Rain Scene? For the purposes of this article when I talk about a rain scene I am not necessarily referring to literal weather. Additionally, I am choosing examples that focus solely on scenes that emphasize sadness but they can be used to convey oppression in a scene or foreshadow a hitch in a plan that is going well. While these alternatives are interesting, I’d like to keep things as focused as possible so I’m just exploring the sadness variant, plus, this use of a rain scene is the one I most commonly see. Let’s go ahead and start with an example of a rain scene done poorly. We are talking the most clichéd of examples here that actively undercuts the purpose of the scene, leads to predictability in the narrative, and is largely just not all that interesting. That’s right folks, I’m talking about Akame ga Kill here. First off, let me say that Akame ga Kill has interesting ideas and does things that I haven’t really seen in many anime before, but it is also a show steeped in convention and playing things safe. These are the aspects that drag the show down for most people, my self included. Some context is needed here so let me provide that real quick. Akame ga Kill is about a group of assassins fighting against a corrupt government. The group, Night Raid, eventually sustains casualties as the empire they fight forms their own elite task force to dispatch them. The big selling point for the series is that characters don’t really have plot armor, anyone can die, even if it seems like they can’t. At least that’s what I’d like to say. While it is true that there are surprising deaths in the show, a lot of them are painfully obvious and that’s largely because Akame ga Kill over uses rain scenes to convey loss and the grief that characters feel as a result. Nearly every death in the show uses a rain scene, and there are a lot of them. Typically the rain comes in right before the death too, which should put viewers on high alert. If you don’t have much experience with these types of scenes, you may not realize what’s to come, but most folks, even the most casual viewers, are likely to pick up on what’s about to happen. The first time this occurs in Akame ga Kill is when Sheele has a run in with the justice crazed Seryuu Ubiquitous. The fight seems to be close but slightly in favor of Sheele and her Night Raid friends, but ultimately Sheele is killed. Then, the sky lets out a torrent of rain. She’s a side character in the show and this isn’t overly shocking. It’s used to have the protagonist, Tatsumi, undergo forced growth. It’s run-of-the-mill and just not all that interesting. Again, the show uses this same trick when Bulat must square off against his mentor. Tatsumi isn’t strong enough to intervene and help Bulat, which leads to his death. Rain is once again used here to signal the upcoming loss of a more significant character this time albeit in a slightly more interesting fashion. So what’s the big deal with that exactly, why is this bad? To put it simply, it undercuts the deaths of characters and leads to the story being predictable. Remember when I said the show’s biggest selling point was that characters don’t feel like they have plot armor, that anyone is vulnerable? Well, when the show leans into convention like this and obviously declares, “Hey, a character is about to die!” without ever subverting those expectations and allowing the clearly marked-for-death character to live, it actually achieves the opposite. Rather than keep the audience on the edge of their seats, having each fight feel like anyone could really die at any moment, it instead tells the viewer that characters are only ever going to die if it progresses Tatsumi’s character or is clearly announced in advance via a rain scene, as an example. Otherwise, just bad guys die, which is also to be expected. This is why I say Akame ga Kill utilizes this tool poorly. It relies on it too frequently and actively hurts its own narrative. Again, there are worthwhile aspects to this show, but it falls victims to several problems such as this which makes it harder to recommend. In this example we are going to explore a more nuanced application of a rain scene. There are a couple of shows I could have looked to for this, but I’m going to use the shower scene from episode 10 of Love, Election and Chocolate. This may be an anime you haven’t seen so let me give you a quick synopsis for context. Partially a drama, partially a school harem show, a good part of this series is about Yuuki and his childhood friend Chisato. 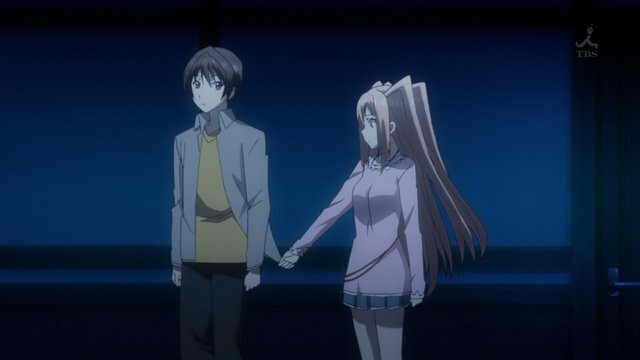 Specifically, the fact that Chisato lost her younger brother in a car accident at a young age and now heavily relies on Yuuki, treating him as a kind of replacement. In addition to this she now hates chocolate. One day, Yuuki gets hit by a car and Chisato kind of loses it. This is the focal point of the only rain scene in the series. Chisato won’t let go of Yuuki and he’s trying to get on with his day. At one point he wants to take a shower but she won’t let go of him. He rips his shirt off and turns on the water, drenching them both. They then have a big confrontation both physically and emotionally. While I couldn’t find an unedited clip, there is an AMV that has the sequence so take a look. Hopefully the limited moments from this are enough to get a general idea of what the scene looks like. What you don’t get to see is the additional layer of Yuuki breaking the mirror in the bathroom and the speech he gives about being his own person to Chiatso. It’s a not-so-subtle metaphor to explain that he is shattering the illusion that Chiatso has been relying on all these years and his warped sense of self because of it. What makes this scene better? For one, it is just a lot more interesting. It’s the only instance of a scene like this in the show, which is already an improvement. Additionally, it isn’t a moment of narrative convenience either, the events make sense. However, it still does convey the sadness in the scene and oppressiveness Chiatso has placed on Yuuki. Lastly, you have the extra layer of the framing with the mirror. Unlike the example with Akame ga Kill, there is more to get from this scene than, “it’s raining so I should feel sad” and then a character dies. Instead, this scene conveys a lot in a very condensed amount of time. Here it is used in a pointed fashion to achieve one goal. You may have even noticed that this scene really isn’t even all that different than your typical overly cliché rain scene, and your right, it isn’t subtle about things at all but that’s the entire point. Rather than feel lazy, this adds to the weight of the events of the series so far and the moment itself. Remember, this is largely a comedy harem show with some dramatic elements. It reframes some of those earlier, light-hearted moments with this new context. What’s important to gleam from this is that it is a more effective scene because it was applied so specifically. I can’t fully do the scene justice with just words and that short clip so I would suggest checking the show out itself. It’s a surprisingly good show that opens up with an attempted murder, so if that’s not enough of a hook for you, then I don’t know what is. You can watch it on HiDive. If you’ve seen Fullmetal Alchemist: Brotherhood then it should come as now surprise that this is the show I turn to for this example. I’m going to be sharing with you one of the most famous scenes of the show, right next to the infamous Nina Tucker scene. Surprise, a character has just died and we are having ourselves another rain scene… except it never actually rains. Let’s take a look at the scene so you can see exactly what I mean. Even if you’ve never seen the show before, I bet you can feel every ounce of emotional weight in this scene and just how much of an impact the death had on these characters. Yet, this rain scene has no rain in it at all. How is this a rain scene you ask? Aside from the literal statement of, “It’s a terrible day for rain.” there is a little more at play here that you might not consciously be aware of. Look back at the other rain scenes and see what they have in common. Did you notice? That’s right, they all rely on you having some knowledge that rain = sadness as a storytelling convention. They are trying to evoke that emotion from you. In FMA: Brotherhood, it’s doing the same thing but instead of leaning into your expectation of a sudden volley of rain, it does the opposite by providing none at all. This scene deliberately subverts your expectations of what should happen here by having the character have a totally normal reaction on a perfectly pleasant looking day. He just simply cries. That’s why when Riza asks, “What do you mean?” is so important. What Mustang is saying is obviously a metaphor but she doesn’t pick up on it, much like a viewer may not immediately either. Her sudden realization in that moment as the tears fall from Mustang’s eyes not only clues the audience in, but really lets the moment hit home. Everything here is more subdued. I wouldn’t go as far as to say this is a subtle scene, but it has a level of nuance that the other examples simply don’t have. Not only that, but it happens in a span of just over 20 seconds. The moment comes and goes but the impact isn’t lost. This is why this is one of the most memorable scenes in the entire show. There is a reason it is so famous and with my breakdown of some other series, I hope you can see just what exactly sets it apart. Thanks for joining me on this little experiment, let me know how you enjoyed it. What are some other examples of good and bad rain scenes that people should maybe check out? Let me hear your voice below in the comments. If you like my content, consider a donation by clicking the button below. Finally, I hope to see you back here at Jon Spencer Reviews again soon! Love this post. Quite a surprise to see FMA take the spot, but also can’t agree with you more! Yes! I’m glad to hear you love it 🙂 I could have picked other examples but the FMA one is just so famous and so good that I had to go with that one! Interesting post. Rain is overused in anime, especially in weepy dramas. The only exception for me is Garden of Words where it is crucial to the main plot. FMA’s “it’s raining” scene is such an emotional moment. For sure, it’s really good. Interesting post. I always find rain being used for death and sad moments for characters to be a little overdone. It works when the rest of the story and aesthetics support the mood but wen it just rains and that’s meant to convey the whole emotion and nothing else really conveys the point, it just ends up seeming trite. Still, there are plenty of stories that use the device well and so as normal it is about the execution. Thanks for sharing your thoughts and I really enjoyed reading your examples.